This month marks the 55th anniversary of the first attempt to desegregate Little Rock’s Central High School, by the nine brave students known as the Little Rock Nine. Now the school carries a designation as a National Historic Site, managed by the National Park Service. A Visitors Center for interpretation and information stands across the street — and that will be the center of the official commemoration of the 55th anniversary of the desegregation crisis. 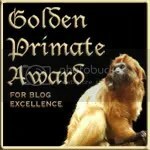 Experts, scholars, celebrities, and a film festival. Ain’t that great about America? We have a great crisis; it takes a couple of years but we work through it. Then we designate the site for historical purposes, and within a half-century we have a festival where, among other things, we note how much progress we’ve made as a nation in living up to the ideals laid out in the Declaration of Indpendence, the Constitution, the Gettysburg Address and the Letter from Birmingham Jail. Only in America, right? Here’s a list of events and activities I got in e-mail today. If you’re in the area Sepember 21 through 25, go see. Call for reservations. 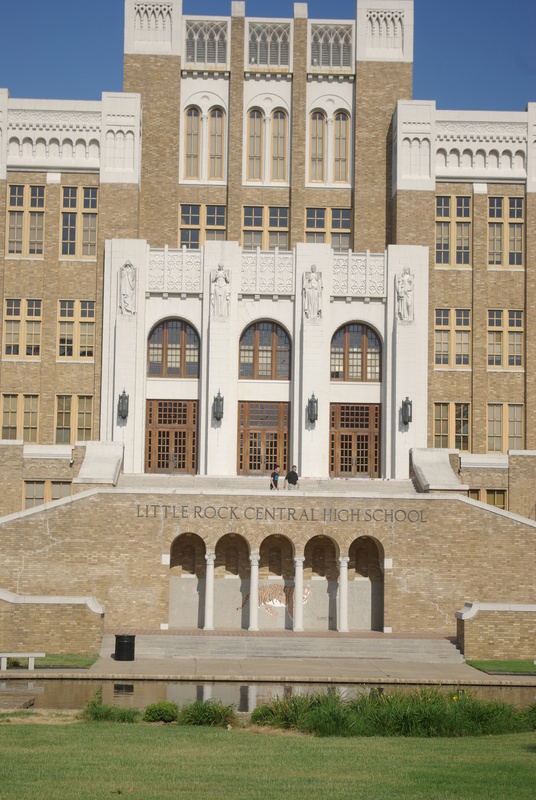 Little Rock Central High School National Historic Site, in partnership with the Little Rock Film Festival, commemorates the 55th anniversary of the desegregation crisis with a variety of events this month. The events, which take place in various venues, are FREE and open to the public, but tickets are required. The Little Rock Film Festival presents The Reel Civil Rights Film Festival which will be featuring documentaries and films related to past and present civil and human rights issues in the United States and abroad; an intimate conversation with iconic Olympic Gold Medalist Tommie Smith; guest directors; panel discussions; and a special awards ceremony to honor the Little Rock Nine and humanitarian Harry Belafonte. Saturday, Sept. 22 – MTV’s “Real World” Kevin Powell Speaks! Kevin Powell, activist, writer, public speaker, and entrepreneur speaks at Oxford American Magazine, located at 1300 Main St. in Little Rock at 10 am. Screening of Harry Belafonte’s documentary, Sing Your Song: The Music, Hope and Vision of a Man and an Era, guest remarks by Mr. Belafonte; and an awards ceremony to honor both the Little Rock Nine and Belafonte at Argenta Community Theater, located at 405 Main St. in North Little Rock at 6 pm. 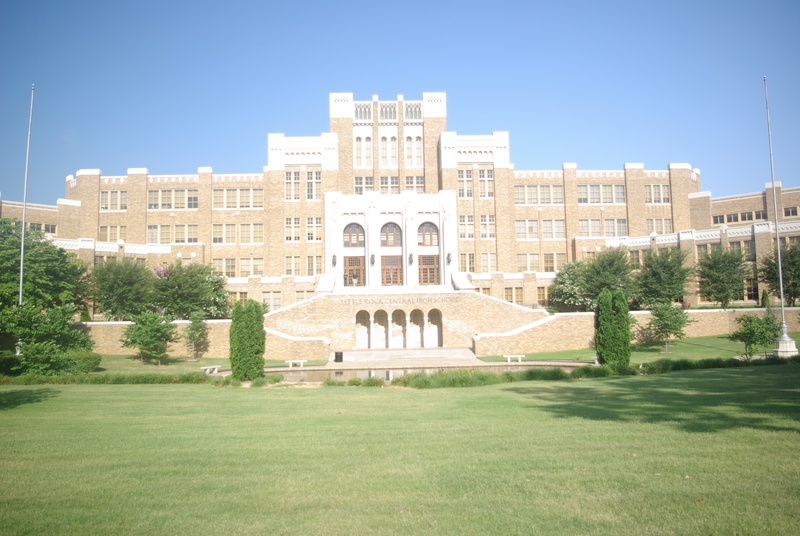 Little Rock Central High School National Historic Site is located at 2120 W. Daisy L. Gatson Bates Drive, diagonally across the street from Central High School. The visitor center is open from 9:00 a.m. – 4:30 p.m., seven days a week. Admission is free. For more information, call 501.374.1957 or email chsc_visitor_center@nps.gov. Five days on the road and we hoped to make it home Friday night. "I've got the Presidential Seal / I'm up on the Presidential Podium. / My Mama loves me, she loves me . 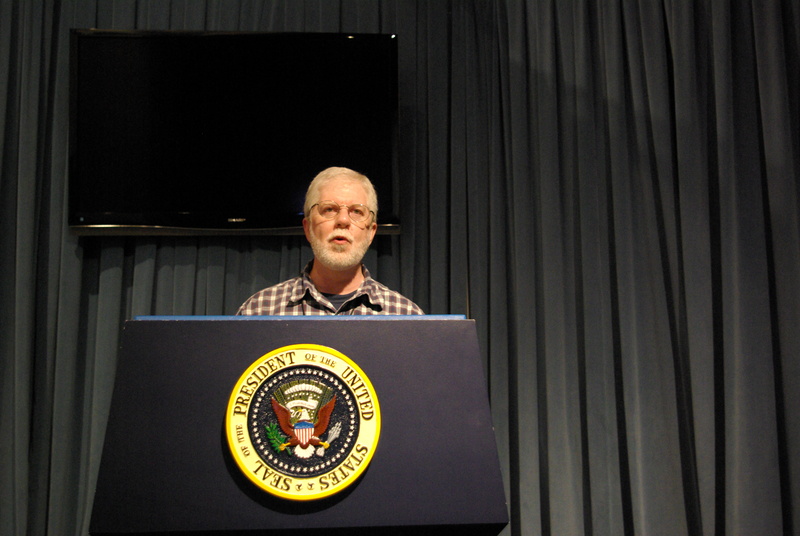 . ."* Playing around with the podium and teleprompter at the George H. W. Bush Presidential Library and Museum in College Station, Texas. Air conditioning on the bus failed, and then the vacuum system failed and we lost the ability to close the door, and we started to lose brakes. Fortunately, we were within sight of Dallas when things really came to smash. So our Teachers Tour of Presidential Libraries came to an interesting end last night. More good fortune — the bus stalled out in the parking lot of a gas station with a Dickey’s Barbecue attached. Ross Perot is right, at least about this: Dickey’s food is worth the stop. Other stops along the way provided nutrition for our minds, and for our classroom preparation. Education experts at the 13 National Archives-related Presidential Libraries work together, and work separately, to create classroom friendly and classroom ready materials. Beyond the museums, we were looking for history to use in our classes. We got a lot of pointers to documents our students can use in class to learn history and how to write it. This is the second year of this particular Teaching American History grant, from the U.S. Department of Education to the Dallas Independent School District. It’s important that you know that, because Republicans in Congress propose to cut this program out. 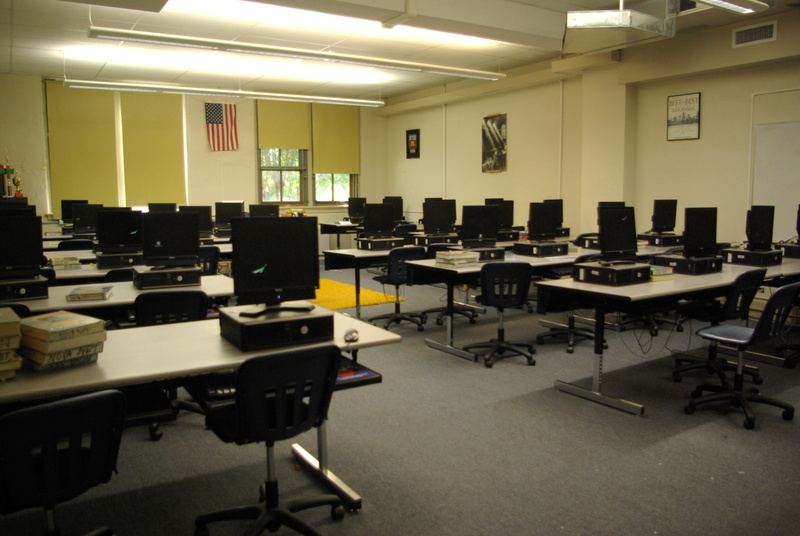 This is one of the few programs I think has value way beyond the dollars spent on it. TAH may become just one more victim of the conservatives’ War on Education. I hope to post more about what we learned. We toured the George H. W. Bush Presidential Library and Museum in College Station, Texas, the Lyndon Baines Johnson Presidential Library and Museum in Austin, the Audie Murphy and American Cotton Museum in Greenville, Texas, the William J. Clinton Presidential Library and Museum, and the Little Rock Central High School National Historic Site. How’s your summer been so far? * Paul Simon, of course. September 2007 – This month, our nation marks the 50th anniversary of the Little Rock Nine’s attempt to integrate schools. 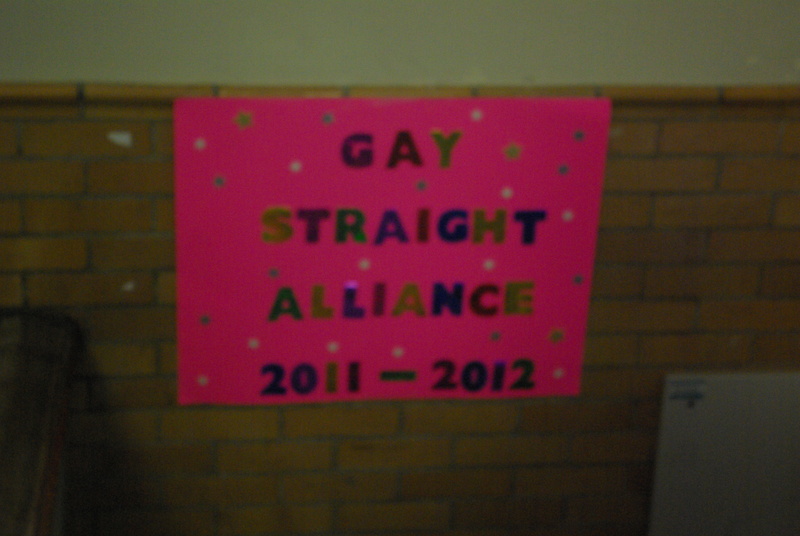 Have we really learned how to break down barriers? This lesson plan is excerpted from the 2007-2008 Mix It Up Planner. Learn more about national Mix It Up at Lunch Day, to be held on Nov. 13, 2007! Students will draw conclusions about boundary crossing from history and literature. Students will identify boundaries in their classroom or school, cross those boundaries, report back and reflect on what they learned. Tolerance.org carries several lesson plans teachers will find useful. Elizabeth Eckford graduated*, went on to a career with the Army as a journalist, and is the only one of the nine students (all of whom graduated and did well) to live in Little Rock today. 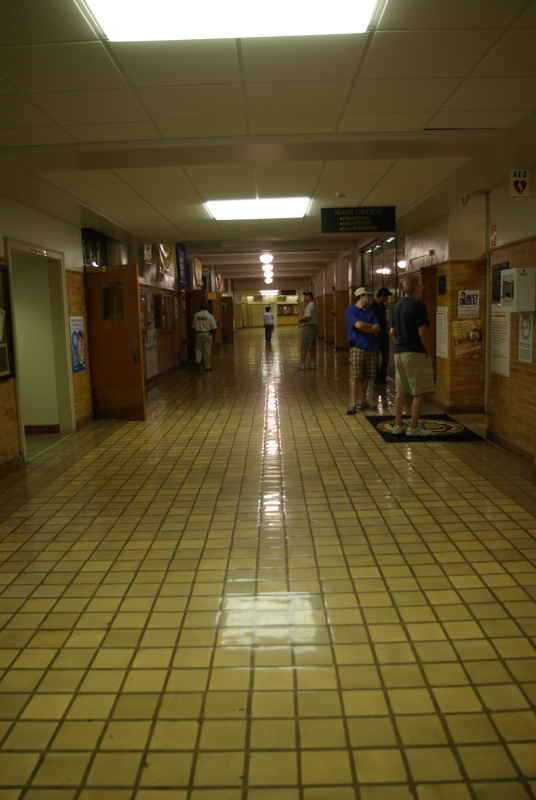 Central High school is a National Historical Monument — and still a high school. What I want to know is this: The woman in back of Ms. Eckford, face thoroughly engaged in delivering a piece of her mind, I suppose: Who is she, and where is she, today? Does anyone know? * Ernest Green was the only senior among the Nine — he graduated in the spring of 1958; the others had a more difficult path. Dr. Martin Luther King, Jr., attended Green’s high school graduation ceremony. 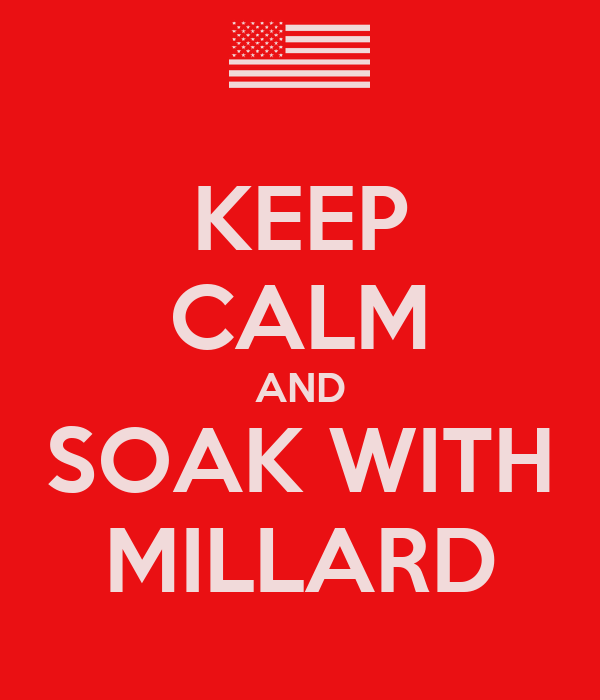 When I met him, he was Assistant Secretary of Labor in the Carter administration. Green is an Eagle Scout. Central Arkansas Library System lesson plan on Arkansas’ top ten events in history; the 1957 events top the lists of several journalists. A top ten events in any state’s history might be a good set of activities for any state history course, especially if you can find a list of a top ten from state newspapers or other sources. You are currently browsing the archives for the Little Rock Nine category.